HUNTINGTON BEACH, Calif. /California Newswire/ — The Surf Sak(TM) from Seth Schiller Enterprises is the first compact dual-purpose adjustable clothes changing invention made with 100 percent waterproof-nylon material that allows all who "towel-change" at the beach, to do so without the need of a towel. The Surf Sak also converts into a backpack once the top and bottom strings are drawn in. In a recently conducted field survey, every Surfer who used the Surf Sak(TM) to change out of their wetsuit highly preferred using it, to a towel and asked where they could buy one. "The first day out demonstrating the product to retailers, we sold into six local surf shops!" explains Seth Schiller, Sales & Marketing Director for The Surf Sak. 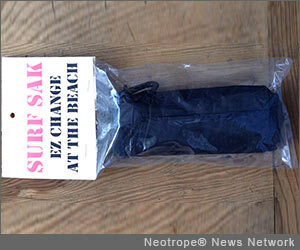 Made in the USA, the Surf Sak(TM) comes with a 100 percent Lifetime Replacement Guarantee.